Where do items go after they are collected? Wondering if an item is collected with your weekly collection or should be brought in to the Enviroservice Station? 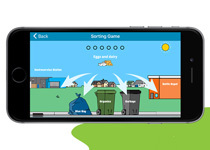 See our Green Routine waste services quick guide (6.2 MB) . levels of waste sorting. Each level passed lets you add items to your beautiful virtual park. Become a master sorter! Play now! If you have any questions or notice an item that should be added, please contact Utilities (780-449-5514 or greenroutine@strathcona.ca). You can also use the quick guidelines to help you determine where to properly dispose an item.